We left behind the snowmen and morning markets of lovely Takayama to head south to Osaka to visit some good friends for a few days. Knowing my desire to meet vegetables and their farmers, they mentioned a small weekly market sponsored by a local non-profit. (Full disclosure: My friend works there.) My calendar was marked on the spot, and Wednesday morning found us at Osaka's Kamishingo station. Suisen Fukushikai provides child and adult daycare services for everyone in the community as well as the intellectually disabled. Started in 1956, the organization grew from a single building serving 40 children and their families to a multi-sight, multi-service group that offers vocational training, transportation services, elder care, and nutrition education. Concerns about food safety and nutrition, Suisen Fukushikai purchased farmland in nearby Tanba and began working with area farmers to grow the food they serve as well as provide outdoor opportunities for clients and their families. 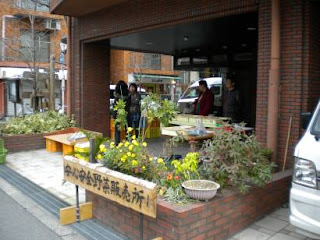 The weekly market became a natural off-shoot of these activities. Community and client volunteers staff the tables, and neighbors get to have a weekly supply of reasonably priced, fresh organic vegetables a few steps away under the portico of the organization's main building. Started six years ago, folks living in the area descend promptly to gather up the organic vegetables, beans, rice, and homemade pickles. "The market has become more popular over time because people know we just dug them yesterday to bring them here. Everything is fresh and has less chemicals," said one of the volunteers. Shoppers find the best the season has to offer each week as it comes fresh from the field. Those not wishing to rush down at 9am when the market officially opens arrange to pick up a bag of assorted vegetables later in the day for a mere 500 yen. A recipe or two is often tucked inside, and the one offered that week was nanakusagayu, a New Year's dish to settle the stomach after a week of feasting. I was a bit envious as I looked at the long onions, chingensai (pak choi), mizuna, and daikon poking their heads out of the bags waiting for owners to arrive. I didn't need any groceries, but they were lovely specimens. 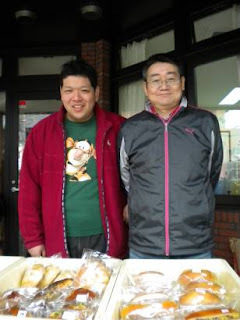 The market also featured breads, sandwiches, and pastries from Suisen Fukushikai's other little sideline: bakeries. Also started as a way to give clients meaningful work, the bakeries provide for the more than 15 daycare locations and sell to area restaurants, too. Starting with organic flour and fresh, whole ingredients they produce a scrumptious array of breads, sandwiches, and pastries. A bit picked over by the time we arrived, it was still difficult to choose from the selection of beautiful items. About to embark on one of our urban hikes, we picked up a little road food and other irresistible items. 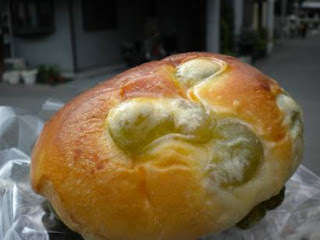 For lunch, we grabbed a chicken-pesto-cucumber sandwich each and a sweet green bean bun to share. Homemade kikuna pickles (kabu greens) were our side dish, and I couldn't resist the akamai. (It reminded me of the KOOGA students I'd been reunited with at the UN University Market back in fall.) Next time, we'll head out the door a bit earlier. 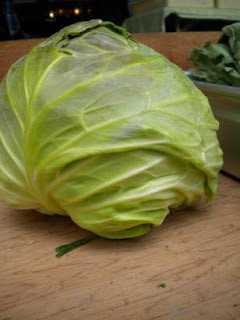 The market officially opens at 9am, and I'd suggest getting there then if you're seriously shopping for produce. If you're not a serious shopper, I'd still arrive no later than 10am to get an idea of the selection, and pick up a package of their beautiful beans or akamai (red rice) to jazz up home meals or as a gift. Prices are very reasonable, and proceeds support the farmers as well as the organizations work. Osaka'sKamishingo Station - Go to the North exit and turn left. Suisen Fukushikai's market will be a three minute walk on the right.